Edward Leo Ferris [1891-1918] was born in Spencerport, New York. He is in the Jeffrey Ferris lineage through his son Joseph. He joined the New York National Guard in 1917, and when it was Federalized, continued in the machine gun company of the 108th Regiment. A local American Legion post is named after him. I came across this while methodically examining the records of men in the appropriate age group to find any that I missed in the Veterans Day post. 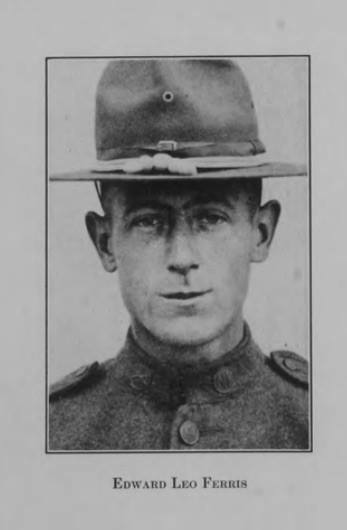 This is the second soldier in the Jeffrey Ferris lineage to have given their life in the service of their country during World War I. 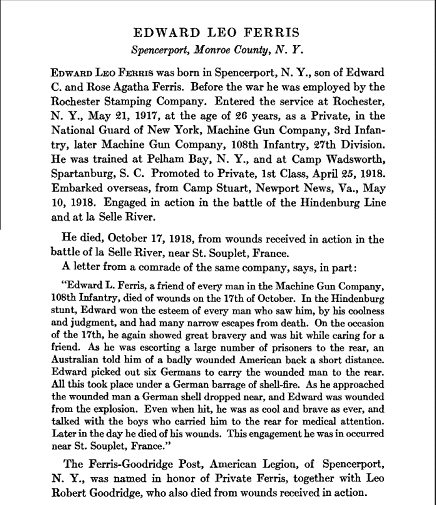 The information about his death was found in a digitized book online, World War Service Record Rochester and Monroe County, N.Y. through the Monroe County Library, as was the photo. The U.S. Army followed the example of the British in the war by assembling machine guns into companies. Machine guns were relatively new in warfare and the notion, I suppose, was to concentrate these very effective defensive weapons. The infantry divisions in the American Expeditionary Forces contained 260 machine guns, 36 of which were used as antiaircraft weapons within the division field artillery brigade. The remaining 224 guns were distributed among a machine gun company organic to each infantry regiment and among three machine gun battalions. Assigned to each of the two infantry brigades within the division was one machine gun battalion, commanded by a major, and composed of four machine gun companies; these companies were identical in organization to the regimental machine gun companies. Each battalion had an assigned strength of 28 officers and 748 enlisted men and was authorized 64 heavy machine guns, divided equally among the companies.